Dumplings are a bit of a time commitment to make, but if you can manage, it’ll go by in a flash, and you’ll all be rewarded with more homemade dumplings than you can eat in one sitting. It’s fun and you can stock the freezer, ready to boil for any given easy weeknight dinner. 1. Soak the dried mushrooms in hot water for about 15 minutes until softened. Squeeze the excess water out, remove stems, and chop into a fine dice. 2. Dice the onion and brown in a frying pan. 3. Finely shred the cabbage until you have 1 cup. 4. Place the shrimp in a food processor and pulse until it is a chunky mixture. Be careful not to over-process, you don’t want to create a paste. 5. Combine the pork, shrimp, mushrooms, onion, cabbage, 1 beaten egg (reserve the other one to make an egg wash), and all the remaining seasonings. 6. Knead the mixture with your hands until just combined. Cover and chill for 10 minutes. 7. While mixture chills, line a few large baking sheets with paper towels and dust lightly with flour. 8. Take one of the wonton wrappers and place a small mound of filling in the center (don’t over-fill or it will be hard to seal). Dip a finger in the egg wash and dab a little on the bottom half of the wrapper. Fold the top edge over and press to seal, creating a half-moon shape. 9. Moisten the curved edge again, and using the thumb and forefinger of one hand, form pleats. Place the dumplings on the lined baking sheets as you complete them, arranging them in 1 layer so they don’t stick to one another. 10. Cook the dumplings in a pot of boiling water (they’re done when they float), or in a hot pan. If pan-searing, heat vegetable oil in a skillet until hot, but not smoking. Fry the dumplings until the bottoms are lightly golden, about 2-3 minutes, then add ½ cup water, cover with a lid, and cook until the liquid is evaporated and the bottoms of the dumplings are crisp, 8-10 minutes. 11. Serve dumplings immediately with dipping sauce. 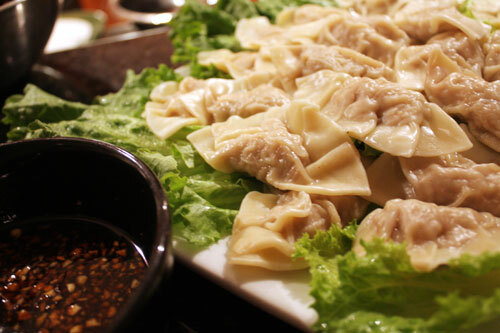 This entry was posted on July 2, 2010 at 9:43 am and is filed under Cooking, Daily Life, Family, Friends, People, Personal, Random, Recipe with tags cabbage, dumplings, garlic, ginger, mushrooms, oyster sauce, Pork, recipe, sesame oil, shrimp, soy sauce, wonton wrappers. You can follow any responses to this entry through the RSS 2.0 feed. You can leave a response, or trackback from your own site. Oh yum, this has inspired me to cook dinner. I needed that! Thank you!! Amanda, they look fabulous!! Do you ever serve them in soup? Hmmm…I could eat a bowl of dumpling soup right now.. These look so yummy! Your recipes always make me hungry…gotta go raid the fridge now, but I know I won’t find anything in there anywhere near as tempting as these dumplings!